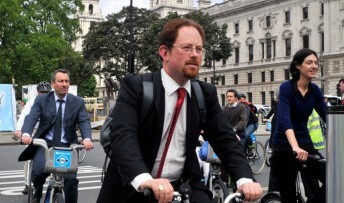 News that Cambridge can bid for a share of a £30 million government fund to improve its streets for cyclists has been welcomed by the city’s MP, Julian Huppert. The announcement came from Liberal Democrat Transport Minister, Norman Baker and Cambridge is one of the cities allowed to bid for the funding. “This is excellent news,” said Julian. “With this investment we could build on the safety measures already in place on our city streets making it safer for cyclists and encouraging more people to travel by bike. “Our commitment to cycling is starting to achieve real investment from this government. It has shown it is serious about making improvements for cyclists across the country. We have already had the promise of money for cycle parking at the station and I am confident Cambridge will benefit further. The funding is part of a £62 million investment in cycling in England and is part of the overall £107 million the government announced last year for investment in cycling. It is in addition to the £600 million for the Local Sustainable Transport Fund.